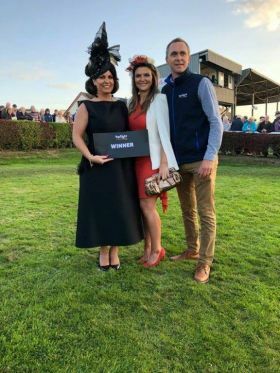 Topflight were delighted to once again team up with Bellewstown Races as the headline sponsor of the Best Dressed Competition. The Lucky winner was Emma Jane Flynn from Termonfeckin who won herself a four star Topflight holiday for two to Sorrento! The competition was judged by one of Ireland's leading milliners, Suzanne Ryan. Pictured from left to right at the presentation: Suzanne Ryan, Judge; Emma Jane Flynn, Winner and Maurice Shiels (Sales Director Topflight).